There are about a dozen different breeds of bats in Britain but they fall into two basic types. 1)The Horseshoe Bats, which have a cone shaped nose leaf and hang by their hind feet with their wings wrapped around themselves. 2)The ordinary or Vesper bats, which have a muzzle similar to a dog and prefer to hang against a surface like a wall or tree. These bats fold their wings alongside their bodies. Bats with nose leafs include the Greater Horseshoe bat, the Lesser Horseshoe bat, the Natters bat, the Whiskered bat, the Pipistrelle bat, the Daubenton’s bat and the Noctule bat. Some of the bats that are without nose leafs are the Vespers bat, the Long Eared bat, the Serotine bat, the Barbastelle bat and the rare Bechsteins bat. During the winter bats tend to hibernate in caves but some prefer hollow trees or crevices in stonework. During the summer they tend to roost in buildings, trees and bat boxes. The bat which uses bat boxes most often is the Brown Long Eared Bat, their ears are as long as their head and body and their wingspan is approx. 25cm. The Pipistrelle Bat is the most common bat in Britain. 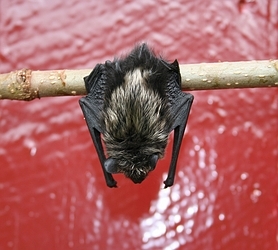 It is our smallest species with a wingspan of only 15cm and is often mistaken for a baby bat. They live in large nursery groups. Bats are very sensitive to the weather and can put off having their single baby until weather improves; they can live up to 15 years.